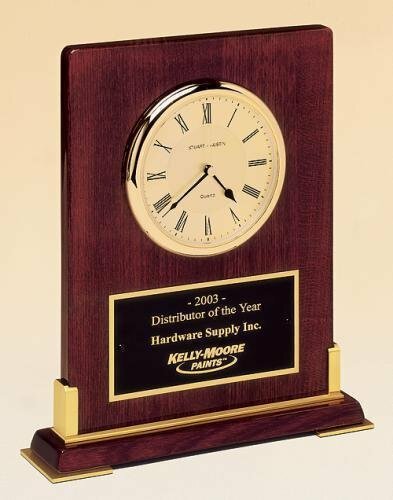 Rosewood piano finish arched Desk Clock with solid brass base and three hand quartz movement. Laser engraved metal plate. Individually gift boxed. Rosewood Piano Finish wood case with three hand quartz movement. Laser engraved metal plate. Individually boxed. 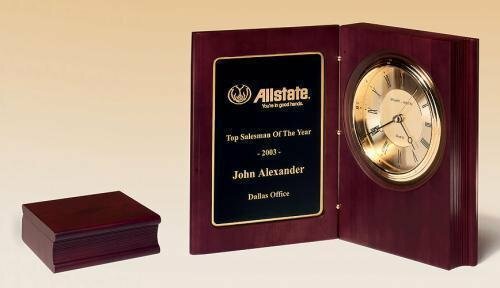 Heavily lacquered rosewood piano-finish wood clock with goldtone metal accents. Three hand quartz movement. Laser engraved metal plate. Individually boxed.